Well, after feeling that September went really slowly, I can’t actually believe that we are almost at the end of October already! I guess it’s something to do with all the family birthdays we have this month – D’s gran’s, G’s, D’s, D’s dad and one of my sisters – an expensive, but fun, month! 1. Top of my list isn’t actually anything to do with autumn, but down to B being home for the week for half term. My prayers were answered and the M6 was pretty kind to us last Friday, so we were all home by about 6.30pm and are really enjoying having a week together again. 2. 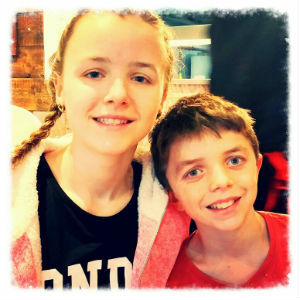 A family meal at Zizzi on Saturday. I had got Tesco vouchers for Zizzi a few weeks ago but then we didn’t manage to get there, so the four of us ate there at the weekend, and it was delicious. I had spaghetti carbonara, which was cooked the more authentic Italian way, without any heavy cream, so wasn’t as filling as it often is. 3. It was D’s birthday this week so, although he was working on the day, we made the most of the time we had together, having a special breakfast of smoked salmon and scrambled eggs, then a lovely evening meal, cooked by B, of koftas and couscous salad – with a bottle of Prosecco, of course! 4. Inspired by last week’s “Back to the Future Day” on G’s birthday, we thought that it would be good to introduce the children to what it was all about, so we watched the first film on Sunday night, then the second on D’s birthday on Tuesday. A real blast from the past, but they are films that still really “work” – enjoyed by all! 5. A trip to the library! I absolutely love going to the library and taking my time to meander around the shelves and selecting a real mix of books. The most exciting find this time was a bit of a weird one, as it is a murder mystery by Richard Castle, who is actually a fictional writer in the fabulous American TV series, Castle, which D and I love, but I had no idea that “someone” (no one seems to know exactly who!) had ghost-written books under that name. Intriguing – and very well written. 7. 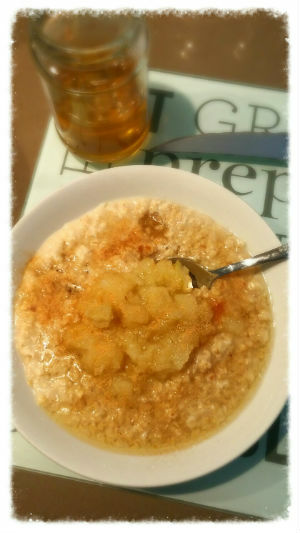 Autumn breakfasts – I know that you can, and indeed we do, eat porridge all year round, but I’ve been particularly enjoying my seasonal version this week – oatmeal cooked with coconut milk, with apple compote, honey and cinnamon. Just delicious. 8. Layering! 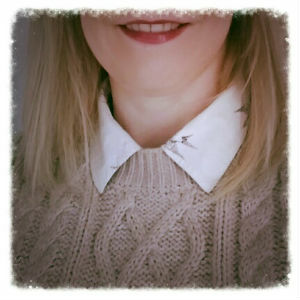 I love this time of year, as you never know quite how the weather may turn out or change throughout the day, so layers are definitely the way to go, with cool shirts under cosy jumpers, thick socks under my boots, etc. Lovely. 9. Candles – yes, G and I are a little obsessed with candles right now, but it’s so lovely to close the curtains, now that the clocks have gone back and it’s getting dark so early, and light some gorgeous candles. I even found a fabulous grey one which I now have on my desk here, so I think that I have just about every room covered now! 10. 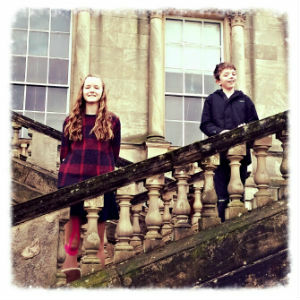 A trip to Kedleston Hall yesterday. It was a pretty quick trip around the hall, as we have been there previously (how I wish that G and B were more interested in history though, and savoured these places more) but it was followed by a very nice cream tea in the restaurant for lunch, so all in all, a nice trip out. Hi there – I’m back! I was asked a few times about the lack of Happy Friday post last week, but it honestly was simply due to a lack of inspiration and photo opportunities – not in any way a reflection of it being a bad week, just a very “ordinary” one. However, I’ve had no problem coming up with my “happy list” this week! 1. G’s birthday party last Friday evening. 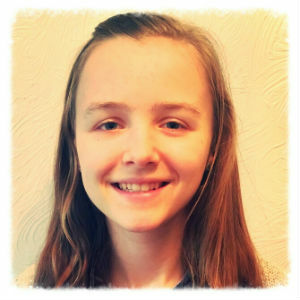 She invited six friends around after school, and, after getting changed and eating cupcakes, they went shopping for a couple of hours in Intu, Derby, where we then met them for a meal at TGI Fridays – sitting on separate tables, of course! The staff there were fantastic though, keeping us up to date on the progress of the girls’ meal, so that we could take our time accordingly, and really looking after them well. We then took the girls home for a quick tie-dye activity, before three of them had to leave and the remaining three stayed for a sleepover. I have to say that I love the fact that parties are now so much easier and low maintenance -they very much looked after themselves, and we didn’t hear a peep from them all night, so it was all very successful -and G has some lovely friends! 2. This was then followed by a lovely day on Saturday, which saw us heading up to Lancashire. We collected B from school and then went for a delicious lunch in Lancaster, before heading over to Lytham to visit D’s parents and gran, who had celebrated her 98th birthday the day before. We did try to see the Blackpool Illuminations on the way back to Lancaster to drop B off again, but failed in this mission, as the traffic was at a complete standstill – not moving an inch – so I’m not sure what the issue was there. 3. 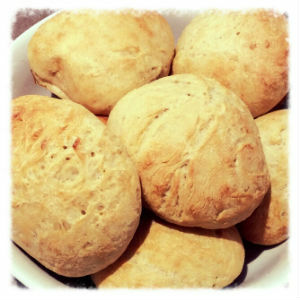 Sunday morning was a lovely, chilled affair – my favourite kind – which gave me the chance to make butternut soup and homemade bread rolls – so yummy! 4. 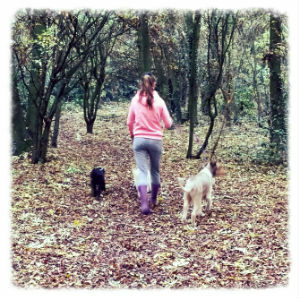 G has been on half term this week (and next, lucky thing!) so it has meant that a couple of our mornings have been much more relaxed and slower, which has been lovely. 6. 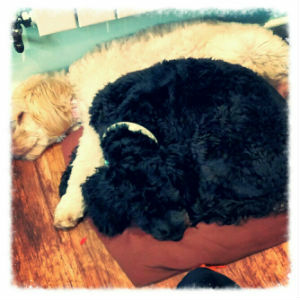 The pooches have been particularly cute this week – they were trimmed last week, so are all velvety and sweet-smelling, but they just keep cuddling up together, which is the sweetest thing! 7. It was G’s birthday on Wednesday, and we had a lovely girly day. This obviously involved shopping, as she had received some money and vouchers as gifts, so she had lots of fun spending them, on both clothes and things for her room, which is in the process of being decorated. 8. G and I then had a great trip to the theatre on the evening of her birthday. D was supposed to be with us, but sadly there was an accident on his way home from Stoke, so the journey took him 4 and a half hours, hence he missed the show completely. It was a great amateur performance of “Me and My Girl” at Derby Theatre, and it was lots of fun – especially seeing G cringe during the audience participation (which did only involve people clapping along with the music!). 9. As you can see from the photos, we had an additional houseguest at the weekend (along with G’s party guests) in the form of a beautiful racing pigeon. Lottie and Honey found it hiding in the woodpile when they went outside after we returned home from TGI Fridays, so D fetched it in, and found that it appeared to have been injured several days before, possibly on a telegraph wire. So we made it a temporary home in a cardboard box, and gave it water and corn, which seemed to help it perk up a little. 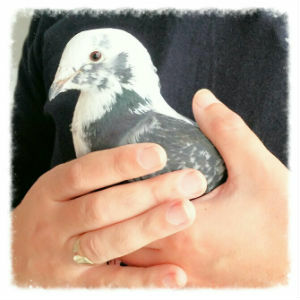 On Saturday morning, D then managed to locate its owner, thanks to the ID ring on its leg and a website of all registered racing pigeons, and its grateful owner came to retrieve it on Sunday. 10. Well, the M6 beckons for me and G today, as we happily go to collect B for the half term holiday. I think that we are all very much looking forward to being together again for 9 days, so here’s hoping it’s kind to us! Well, last Friday was the first time that I have missed writing a Happy Friday post since I began this blog just over six months ago, and I did have a good excuse – I was down in Kent for a lovely family wedding, so didn’t have a computer with me. But I’m back! 1. 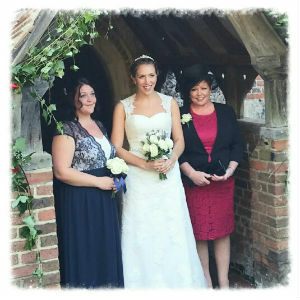 My niece’s wedding has to be my number one – obviously! It was all lovely – from the amazing sunny weather to the beautiful bride and bridesmaids, the men in their uniforms, the food, the amazing little touches like the welcome champagne slushy (a huge hit! ), popcorn, candyfloss and the ice cream van. Not to mention that fact that my sister gave a fabulous mother-of-the-bride speech! It really was a lovely day. 2. 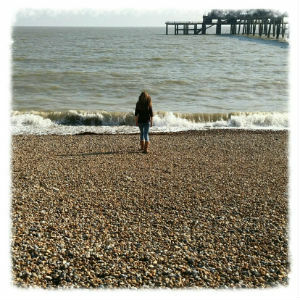 G and I had a lovely girly trip down to Kent for the wedding, as D had to go up to collect B from school for the weekend. 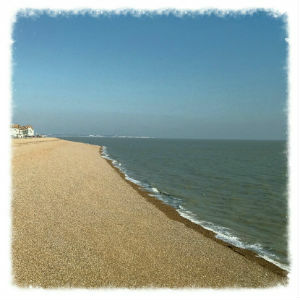 We had a great morning before the big event, wandering around Deal, along the pier and on the beach. It’s not an area of the country that I know well at all, and I was blown away by how beautiful it is. 3. The bed and breakfast we stayed in the night before was also a highlight. We had a lovely room, beautifully decorated, and the owner was very friendly and welcoming. And of course, there are few better ways to start the day than with a great B&B cooked breakfast – delicious! 4. 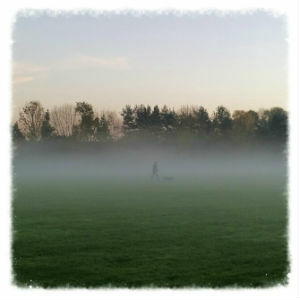 It was then lovely to get back home to spend the weekend with B – so nice to all be back together again. 5. One of the things that B is loving about his new school is doing Food Technology, so he came home brimming with enthusiasm to demonstrate his new skills and recipes. He made sweet and sour chicken for Saturday lunch, followed by lasagne on Sunday. Not only were the meals absolutely yummy, as soon as he had finished cooking them, he then washed and dried everything he had used, put them away, cleaned all the surfaces and polished the sink! I could get used to this! 6. I have had a stinking cough and cold this week, so I have been indulging in plenty of comfort food, with the absolute ultimate being meat and potato pasties, made according to my mum’s recipe. It is so long since I have had these but they tasted so good. 7. Despite the dreaded lurgy, I have had quite a productive week at home, getting on top of all our home filing one evening, and then eventually organising the photos I took of doors in France (almost three years ago!) into a collage, which I have ordered in poster form, so that I can then frame it. I get there in the end! 8. Maybe in another nod to creature comforts, I have started knitting a blanket this week. I am not a great knitter – scarves and squares have been my only specialities in the past – as I really need to keep it simple. I decided that a blanket can be very simple, and I have nice, thick, chunky wool so it grows quite quickly which is satisfying, but it is going to take a while to be big enough for a blanket. A nice project though, hopefully with a luxurious result. 9. I made a decision this week that has also made me happy – I am going to try to volunteer at a nearby hospice. Ever since my mum spent her final days in one almost ten years ago, I have wanted to do this, but the time has never been right, with the children, home and work to deal with. However, there was a piece in the news earlier this week about how we are the best in the world at providing end-of-life care, which made me realise that now is actually a really good time for me to eventually be able to do this. I have contacted the hospice, and hopefully will be able to sign up for their training programme starting in January, so that I will then be able to volunteer once a week there. 10. A light-hearted one to end with! 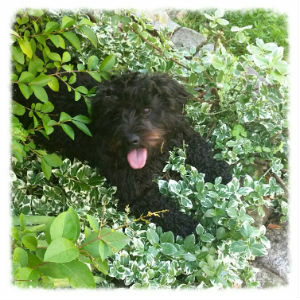 Whenever we come back through the back gate from a walk, Lottie plonks herself down in the low variegated bush just inside the garden. This has become a real habit – not sure why she does it, but how cute does she look? So we are off to Norfolk this weekend, which I’m really looking forward to, as we haven’t been for about 7 weeks. As D has been away all week, it will be really nice to spend a lovely relaxing weekend together – although also poignant, as it will be our first trip there without B.